The British newspaper the Daily Mail offers coverage of the Bastille Day terror attack in Nice, France. One eyewitness described seeing 'bodies flying like bowling pins' and 'hearing noises, cries that I will never forget' as the horror unfolded on a busy promenade in the southern city of Nice at around 11pm last night. Identity documents belonging to a 31-year-old French Tunisian were later found in the bullet-riddled truck after the gunman at the wheel was shot dead by police, security sources said. The source added: 'The identification of the truck driver is still underway.' The recovered papers indicate the man is a resident of Nice. 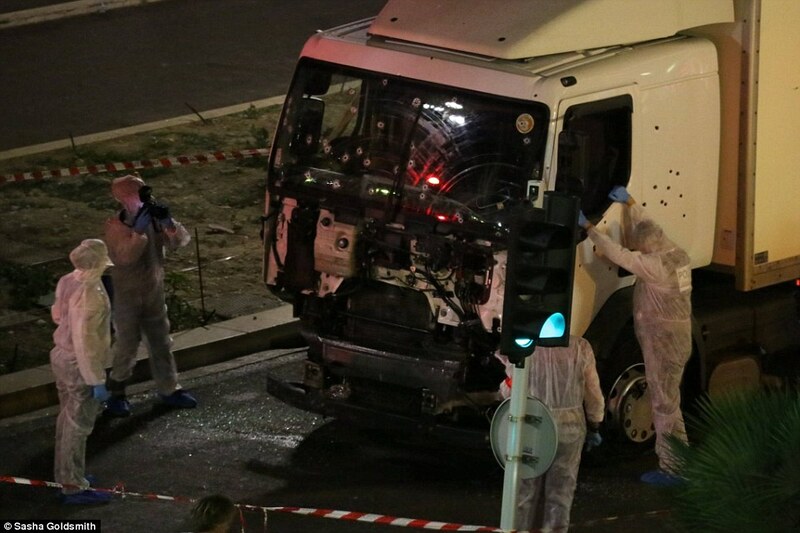 The truck driver was said to have shouted 'Allahu Akbar' – God is greatest – before being killed. Pro-ISIS groups have been celebrating the attack, orchestrated to coincide with France's most important national holiday, but as yet the terror group has not officially claimed responsibility. A huge cache of guns, grenades and 'larger weapons' were later found inside the lorry, which mounted the pavement at approximately 40mph and steered directly towards hundreds of people watching a fireworks display. Around 100 revellers are then said to have dived into the sea as panic ensued and holiday crowds desperately ran for their lives. Anti-terror police swooped in as the city was put on lockdown and residents were warned to stay indoors for their safety. Addressing the nation, French President Francois Hollande said several children were among the dead, with 80 victims confirmed so far and a further 20 people gravely wounded. He added that it was 'undeniable' the massacre was a terrorist attack.